DRONIE | What Does DRONIE Mean? 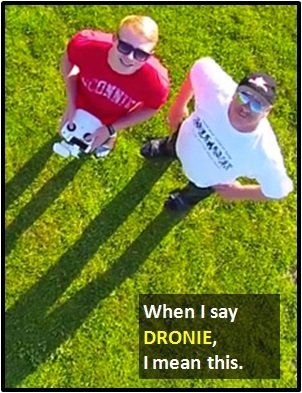 DRONIE means "Drone Selfie." It is a photographic self-portrait taken with a drone. DRONIES gained popularity in 2014 after drones became commercially available to the public. The word DRONIE is attributed to the vlogger Jakeb Hone who regulary takes pictures and videos with a drone. The image shows a selfie taken with a drone. Person A: I finally bought a drone! Person B: You've wanted one for ages. Have you taken a DRONIE yet? The term DRONIE is an amalgam of the words "drone" and "selfie."